No need to hurry. After the jangle-guitar opening we receive the leisurely beat; soon a bassline; and only then does the song opens to images of man-made guardian angels, ideas combined in the way the urban electropoppers Electronic do so well. Their first track has a summer evening sound – the video showed Bernard and Johnny mooning around the Maldives – even if the song gets barbed later (“Hark the herald angels sting”). Johnny told Melody Maker he nearly fell into a volcano during the shoot. A metaphor for how this song mixes reality into the beauty, hurt into the love. Danger in the most lovely of things. New bands battle to get noticed. “Why won’t you look at me? / I live and breathe,” Bernard sings, but this was a newly-formed supergroup so didn’t have that problem: instead there’s the pressure to be amazing. Supergroup credentials? Bernard Sumner and Johnny Marr running with the idea of mixing the synthesizer sound of New Order with Marr’s complex guitars of The Smiths. They got together in 1988 and didn’t mess around, got right down to it with confidence based on their skills. Just pay attention to the sections without bass guitar after the three-minute mark, the reflection after the storm. Then the programmed drums break in and slap you. Pressure, yes, but they deal with it easily. This is confidence: a polished, flawless gem of a song that doesn’t dull with time. The song was recorded in Johnny Marr’s Manchester home during that key year, 1990. 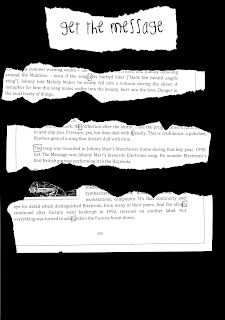 Get The Message was Johnny Marr’s favourite Electronic song. No wonder Electronic’s first British gig was performing it in the Haçienda. Form fits theme, and Bernard used a whole shedload of technology in making the album: synthesizers, samplers, drum machines, audio workstations, computers. It’s that continuity and eye for detail which distinguished Electronic from many of their peers. And the album continued after Factory went bankrupt in 1992, reissued on another label. Not everything was turned to ashes when the Factory burnt down. 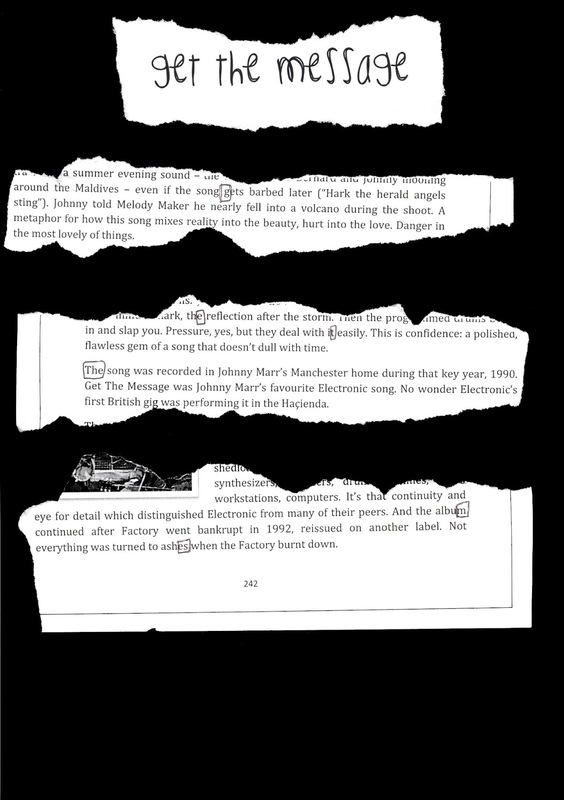 Extract from page 242 of 2000 Tunes: A History of Manchester Music by M. H. Rees; used with permission. Read the whole series (25 extracts) here; or my summary post. Readers might be interested in my forthcoming novel about a man obsessed with Manchester music - confusingly, it is also called 2000 Tunes!